Maya Daily Life - HISTORY'S HISTORIESYou are history. We are the future. Beliefs: ​Why do people live the way they do? Technology: ​How does technology affect people's lives? Economics: ​How has the quest for resources and trade shaped human history? Culture: ​How do we know what we know about human history? While Maya civilization ended with the arrival of the Spanish around 500 years ago, Maya culture continues to enrich the lives of both the native population and tourists in many parts of Mesoamerica today. For this lesson you will explore Maya culture by examining the daily life of the ancient Maya people. By looking at their daily life I think you’ll find that despite the time and distance that separates you from them, their lives were not so different from your own. The ancient Maya lived in cities and enjoyed a good celebration. Their deep love of music and dance filled their lives with joy. They loved to play games. They cared greatly about how they looked, and they loved to dress up in nice things. Of course, they also worked hard to fulfill their responsibilities to their families and to society. Because so little original Maya writing exists in book-form, one of the best places to look for information about the daily life of the Maya people is in their artworks. Maya pottery is one art form that gives us a good look at the daily life of the Maya. Because the Maya did not have a potter's wheel, all of their pottery was shaped using coils of clay stacked one on top of another and then smoothed by hand. The main ingredient of their pottery was clay gathered from the banks of the rivers that crisscrossed their land. The pottery was kept in the sun for drying and hardening. Paint brushes were made from animal hair. Maya pottery was so highly valued that the artists signed their work. Each piece of Maya ceramics is unique, and every one tells a story. One of my very favorites is the vessel on the right. Inspired by the tale of the Hero Twins, you can see the rat sitting atop the piece and the thorns from the sacred Ceiba tree on the sides. Common pottery included great water jugs, plates, pots, and planters. Even the simplest pottery was decorated. True works of beauty, it’s not uncommon to find even everyday Maya pottery encircled by decorative panels or by hieroglyphs. (See below)*. *Animal forms, figures both human and divine, and abstract designs all tell us something about the daily lives of the ancient Maya. Note that each piece tells a story by having both painted scenes and hieroglyphs. Left to right, you see a scribe, a monkey, the Hero Twins, and a seated king. The clay figures the Maya produced were probably used in religious ceremonies. Many were made to rattle or whistle. While the figures were typically very small, they were detailed and brightly painted. Together, they offer us a look at Maya life. The Maya played a variety of musical instruments, including the scraper, top left, and the shaker gourds, bottom. The Maya loved music. It was such an important part of their culture that musicians were given a lot of respect. Musical performances included both the young and old, as well as the rich and poor. Musicians were asked to perform at almost all Maya ceremonies. In addition to religious ceremonies, live music was a part of funeral ceremonies and celebrations of victory during wartime. Music was even an important part of social events like their Maya ball games. 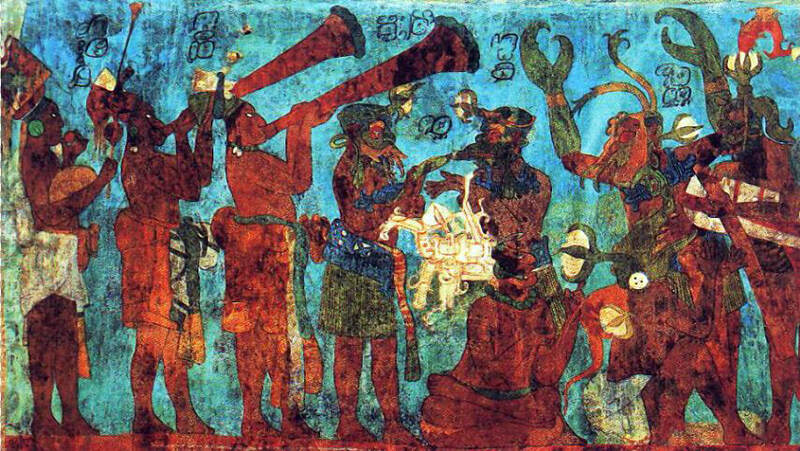 From a mural at Bonampak, horn players and a percussionist on the left accompany dancers (dressed as lobsters. maybe scorpions?) on the right. Cross eyes and fat foreheads were considered beautiful by the Maya, so they took deliberate steps to shape their appearance. Crafts: The Maya made many crafts. They wove beautiful fabrics. They made musical instruments like drums, shell horns, and castanets. Their statues were incredible and huge. The art they created honored their gods or their leaders. Kids: There was nothing more important to the average Maya than the birth of a child. The birth of a child was considered both a sign of good fortune and a measure of wealth. When a child was born they were given a childhood name by a priest, but the family nickname for the child was the name they were known by. When boys reached the age of five, a white bead was woven into their hair. Girls of the same age received a red shell that they wore at their waist. For both boys and girls, these were symbols of purity and could not be removed until they took part in a ceremony marking the end of childhood and the beginning of adolescence. Usually, the boys were fourteen and the girls were twelve when those ceremonies took place. Girls lived with their parents until they were married. Their mothers taught them how to cook, spin yarn, weave, and clean house. Unmarried men painted their faces black and lived in communal houses where they learned about crafts and warfare, and played games. Maya marriages were arranged and did not take place until the men reached eighteen and the girls reached at least fifteen. After marrying, the husband lived with his wife’s parents and helped his father-in-law for three to six years. Above, a figurine of Lady K’abel holding her warrior's shield. Also known as Lady Snake Lord, she was the queen of the Maya city-state of El Peru-Waka. While it was traditional that Maya men hunted and worked in the fields and women took care of the house, because women were responsible for childbirth they were well-respected in Maya society. For the longest time, It was believed that the woman’s role was to weave cloth and fabric, to cook and keep the house clean, and to teach their daughters to do the same. It was assumed that women were subordinate to men, that men were kings and rulers of the city-state as well as in their homes. New evidence, however, shows that women frequently took on more powerful roles as warrior-queens. During the Classic Period, it was not uncommon for women to rule cities in place of an underage son or as the widow of a ruler who died without a male heir. Women also served communities as powerful priestesses. While they did not usually take part in major religious holidays, they frequently ruled over specific sacred sites. Maya women were master wavers. Ixchell, their fertility goddess, was also the goddess of weaving. She is shown below, seated with a loom below right. The same type of loom is still used today. As with so much of Maya culture, traditions became set during the Classic Period. Those traditions included how power and social status were maintained within their society. In other words, during the Classic Period the Maya social order became more rigid. Clothing, was one indication of social status. Clothing for the Maya was about more than comfort and color. It was used as a form of communication. From one’s clothing you could identify someone’s family, social status and community. Certain types and colors of clothing were reserved for special occasions or could be worn only by nobles or members of the royal family. The Maya wove the fabric for their clothing from cotton, hemp, and bark fibers. They used natural plant and animal-based dyes to color the fibers before weaving them into cloth. Common colors included green, purple, blue, black, and red. With great skill, Maya weavers created a variety of patterns, including geometric, floral, animal, and human designs. Using these beautiful and colorful fabrics, the Maya made clothes to drape the body (think Greece and Rome, but with their own unique Mesoamerican style). Frequently, the Maya wore one loose garment on top of another. Clothing for Maya women consisted of long, wrap-around skirts worn with a sleeveless, poncho-like blouse. Their skirts could be either tied with a colorful belt or sash or knotted in place. While all women decorated their skirts, women from the noble families displayed their wealth with more elaborate decorations. They would accessorize with long, colorful scarves wrapped and knotted around their hips. In the winter, Maya women would add a warm shawl or cloak. In addition to these basic articles of clothing for Maya women, women also made use of different kinds of dresses. For instance, one dress consisted of a full-length tunic that was stitched up the sides. Men typically wore a loincloth. The loin cloth was a piece of fabric 10 inches wide and 8-10 feet long that they wrapped repeatedly around their waist before passing the cloth between their legs. At their waist, it had the appearance of a very thick, 6 inch deep belt. Men who were nobles decorated their loincloths, sometimes with feathers. Over their loincloth, Maya men wrapped a skirt or kilt. This, too, could be decorated according to one’s social status. Many men wore colorful cloth turbans on their heads. Depictions of Maya men also show them wearing a pati, a large, square-shaped piece of cloth that was worn like a cape or a poncho. These capes varied from the simple to the fantastic, from colorful cloth to jaguar skins and sheets of feathers hanging down their back. Clothing for special events like their many festivals was exuberant and highly decorated. In its simplest form, the Maya used embroidery to add even more color to their clothing. Clothing for the Maya elite during these public events, however, consisted of large and lavish outfits decorated with feathers and precious stones. Shown at right, important elements of these outfits included large, feathered headdresses, jade jewelry, and clothing made from the skin of various animals, particularly jaguars. Such outfits reflected the wearer’s high status in society. Like other early civilizations, the Maya enjoyed wearing jewelry. The Maya, however, were especially well-known for wearing lots of jewelry. Earrings, nose rings, lip rings, necklaces, pins and more were all considered fashionable. The poor wore jewelry made of bone, sticks or painted clay. The rich showed their social status with jewelry made of gold, silver, copper, turtle shell, and gemstones. Carved jade was especially popular. It’s green color represented life and growth to the Maya. Hats were another way for nobles to show their social standing. With hats, the rule was the higher the better. Each hat stood as high as a noble could handle. Some were even taller than the person wearing it! Feathers were often used to extend the height, and in all types of clothing feathers were restricted to the noble class. If a commoner used feathers, they could be killed. While clothing was perhaps the most obvious way to indicate one’s social status, the Maya also practiced many forms of body modification. As noted above, deforming a baby’s skull to create a pleasing, elongated shape and forcing the eyes to cross were two examples. However, it was also common to file teeth into points and to inlay jade into a tooth. Piercing and tattooing were also widely practiced. The Maya did this so that they would appear pleasing to the gods, for social status and for personal beauty. Because the Maya associated body modification with social status, the noble class performed more extreme body modifications. However, even commoners filed their teeth and tattooed their skin. The most important crop was corn (maize). Corn was everything. They made all kinds of food and drinks from corn. Corn was boiled in lime and then baked into tortillas, or consumed as a drink by making a gruel of it. Flat cakes were also created from corn while some dishes used corn dough filled with other ingredients to create meat or vegetable pies. Corn was so important that some of the nobles even wove their hair to resemble tassels of corn. While corn was king, the Maya had a rich, varied, and healthy diet. The most important crops were corn, beans, sweet potatoes, tomatoes, squash, avocados, papaya, and cacao. Although their diet was largely vegetarian, they did eat meat when it was available. They domesticated turkeys as a food source and they fished local rivers and coastlines. They also used traps, spears, and bows and arrows to hunt animals such as deer, monkey, manatee, guinea pig, armadillo, and wild pheasant. Food was cooked on stone hearths or in clay pots. The main meal of the day was eaten in the afternoon. For a treat, the Maya enjoyed chocolate. The Maya were among the first to discover cocoa beans, to cultivate them as a crop, and to make chocolate from them. Cacao was so important that it could be used as a form of money. Cocoa beans also held religious importance for the Maya and were associated with the Maya gods. Some Maya hieroglyphs and murals show chocolate being poured for gods. Cocoa beans were sometimes used at religious ceremonies as offerings to the gods. Believing the gods would enjoy a nice hot chocolate as much other forms of tribute, cocoa was sometimes even used as a replacement for sacrificial blood. As important as it was to their culture, however, the Maya did not eat chocolate in solid form and it was not enjoyed by all. Instead, the enjoyment of cocoa was usually reserved for special occasions or for the nobles and ruling elite who most often drank it as a morning beverage. Homes for most ancient Maya were simple huts. Sometimes family plots were marked by a low wall of stacked stones and consisted of a garden, a well, and a second hut used a a combined kitchen and chicken coop. The walls of Maya home were made of poles lashed together and covered with plastered earth. The sharply pitched roof was constructed from more poles tied together with tropical vines and covered with layers of palm leaves. Floors were made of compacted gravel that was covered with either white sand or with leaves that were changed frequently. The house was divided into two sections. The rear half was used for sleeping quarters where the Maya slept on either hammocks or on fibre mats placed on the floor. The front of the house was used for everyday activities. Furniture was usually nothing more than wooden stools or benches. Like other ancient civilizations, the Maya believed that illness, injuries, and misfortune were caused by evil spirits or the disfavor of the gods. Shamans were called to examine a person after they became ill. Either the shaman or a priest prescribed remedies including potions and rituals. In addition, herbs, minerals, worms, blood, parts of crocodiles, iguana ashes, and mineral substances were used as medicines. Death was greatly feared by the Maya. Evildoers were condemned to the Mitnal, which was the Maya version of hell. When someone died, they were either cremated or buried. Peasants were usually buried along with personal belongings in the floor of their family’s home. Sometimes people were buried in caves, and children were sometimes buried in pottery jars. Elites, however, might be buried in tombs along with their most prized possessions. Games were an important part of Maya culture. Like the ancient Greeks whose Olympics were held to honor the god, Zeus, Maya games often had religious significance and were accompanied by religious ceremony and rituals, including sacrifice. The most popular and well-known Maya game was the Maya ball game, Pok-a-tok. Pok-a-tok was based on the Maya myth of the Hero Twins you read about in lesson one of this unit and was associated with the underworld and rebirth. For the Maya, the ballgame represented a stage between life and death. Winning the ballgame symbolized victory over death. On the other hand, losing it meant death. There is still some debate about who was sacrificed, the winners or the losers. Whomever it was, since the sacrifice was carried out as tribute to the gods, it was believed that the sacrificial victim would skip his journey to the underworld and ascend directly to heaven. The game itself probably originated with the earlier Olmec culture and was played throughout Mesoamerica. Maya priests and political and military elites usually attended the ball games. The object of the game was to hit a rubber ball through a small stone ring that was placed midway along the wall of the court. The ball could not be thrown, but instead had to be bounced off of hips, shoulders, or forearms. Incredible amounts of money were bet on the games.